Having seen several references to 'War Comforts' I became intrigued as to just what was meant by this term. A little searching unearthed Reports and Treasurer's Accounts of the work of the Failsworth Sub-Division of the British Red Cross, Comforts Section. 14th September 1914 to 31st December 1914 ... 'Failsworth Sub-division of the Red Cross Society, Comforts Section' . 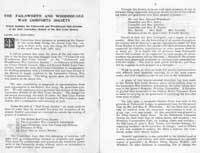 1st October 1917 to 31st December 1920 ... 'The Failsworth and Woodhouses War Comforts Society' which included the closing of activities. The Reports show that the original groups, were mainly based in the local churches and schools but also included the Women's Co-operative Guild, The Ladies Liberal Association and The Primrose League (Conservative Ladies). Each of these groups had 2 representatives on the organising committee. Towards the end of August 1914, barely weeks after war broke out, the British Red Cross had joined with the St John Ambulance to form the Joint War Committee. Their aim was for greater efficiency in fundraising and aid by pooling their activities and resources. Incidentally, this collaboration was brought about again in 1939 at the start of WW2. Also unearthed were two notebooks recording the activities of the Failsworth Wesleyan Church Group; letters from soldiers with thanks for gifts received; programmes and tickets from their fundraising events; and a final handwritten report in December 1918. The two notebooks took the form of diaries, with week by week accounts of the materials handed out, the garments fabricated and returned, the donations received and the fund raising events that took place. Each garment or donation received was listed and had a name attached to it. The notebooks covered the duration of the war and thereafter show brief notes up to autumn of 1919. The first page of Notebook 1 recorded the setting up of the 'Failsworth Sub Division, Red Cross Society, Failsworth Wesleyan Methodist Church, Comforts Section', which was formed on September 26th 1914. A later page, for 24th February 1916 has the statement, 'Disband as Red Cross workers only and join the newly formed Failsworth and Woodhouses War Comforts Society, February 24th 1916.' Puzzled as to the reason behind this statement I turned to the October 1916 Annual Report of that society and found the explanation in the opening statement, "It will be noticed that since the issue of the last report the title of the Society has been changed from the 'Failsworth and Woodhouses Red Cross Society' to the Failsworth and Woodhouses War Comforts Society.' In February of this year the Urban District Council, Allies and General Relief Fund Committees, invited the local Red Cross Committee to amalgamate, for working purposes, with a Committee that had been formed in the district to supply comforts to the Lancashire County War Comforts Association. This being agreed upon, the new Society was known by the above title." The intention seems to have been to bring the provision of comforts under an inclusive 'banner', rather than split their energies between comforts for hospitals and the wounded, organised by the Red Cross, and those comforts for servicemen and prisoners of war, organised by other groups. This is made clear in the subsequent statement, "Under the title of 'Red Cross Society', no work could be done for other than the wounded, but since the formation of the present society operations are extended to include the making of grants of comforts to: 1. The British Red Cross Society. 2. The Lancashire War Comforts Association. 3. Local Hospitals, both Red Cross and Military. 4. Prisoners of War. 5 Local Men on Active Service." The various Reports show much the same information, for instance that the organising committee of representatives from the associated groups were given the use of the (Failsworth) Council Chamber and the Carnegie Library Lecture Hall for their weekly meetings. However, the Introductory pages and those showing 'Prospective Events' can provide some new insights. Still looking at the October 1916 Annual Report we read that, "Through this Society there are now eight prisoners of war in Germany being supported ........... Parcels of food are sent fortnightly, and a supply of bread weekly. 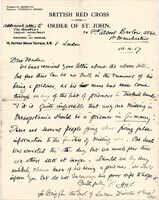 After Dec. 1st, the forwarding of all parcels throughout the country will be done by special organisation under the Red Cross Society in London, but special individual prisoners may be supported by relatives, organisations, or other persons desirous of doing so. ......... The cost of each parcel will be 6/-, and three will be supplied to each prisoner in a fortnight." The 'Comforts' in this same Report, to our 21st century eyes, look more like basic necessities than 'comforts', and listed are thousands of pairs of knitted socks, hundreds of vests, handkerchiefs, bandages, soap, pencils, hats and scarves and, almost incongruously, 1 night-cap, 2 nail-brushes and a deck chair. Altogether 87 different types of 'Comfort' were listed, together with the quantities provided, and sent. In addition, by the end of September 1916, the associated groups had also provided 1 motor ambulance at a cost of £650, 10 field hand-ambulances at £10 each, 2 bicyle-wheeled stretchers at £5 7s 6d each, a Char-a-banc outing and teas for 25 wounded men, £15 in donations to hospitals and garments for 177 men on active service. Looking at the Report's balance sheets for the year we can see that there were numerous groups actively raising money, knitting and sewing etc. The list includes, Woodhouses National Church and School, Woodhouses Wesleyans, Woodhouses British Schools, Wesleyan Church and School, St. John's, Secular School, Ladies Liberal Federation, and Primrose League. Also listed are the Churches and Schools of Dob Lane, Macedonia, New Jerusalem, and Holy Trinity, Also included were Church Street Mission, Bethel Church and the Women's Co-operative Guild. Money had come in as donations and from the sale of material. The expenditure shows that most of the money was spent on the materials for making the comforts, donations to hospitals and support for Prisoners of War. The final Report, covering the period October 1st 1917 to December 31st 1920 includes notes on how the surplus money and goods were used after the cessation of hostilities, particularly with regard to men returning to civilian life from the forces. A further paragraph reports that, "We have the gratification of knowing that one outcome of our labours is the Motor Ambulance supplied by the British Red Cross Society, for use in this district, in consideration of the Red Cross work done by Failsworth and Woodhouses. As we were unable, without collecting the means, to find a suitable garage and to maintain it, we passed on the gift to the Failsworth Urban District Council. 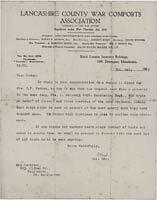 Our request was for the Motor Ambulance, for which we collected £650, and which was sent to France. We were informed that its condition was such that it was unfit for use, and instead, a new Buick Ambulance has been forwarded. We hope it will prove of use in the district and will satisfactorily supersede the horse ambulance." The two handwritten notebooks just record the efforts of one group, that belonging to Failsworth Wesleyan Church, but it is surely a microcosm of what was happening throughout the country. We find the names of the women (and children!) beavering away to try and make life just that bit more tolerable for the men away on active service; we get to see the long lists of basic items of which men were so obviously in such dire need. Reading the pages it's almost possible to feel the energy of the time and the desperate need on the part of those at home to DO something useful. There is a duplication of information in the two notebooks, although the second only starts at the time of the re-organisation in February 1916. The two are interesting as a pair because occasionally, additional but different, details appear in the two books. After 1916 both the notebooks identify the individual servicemen to whom 'comforts' were sent, the specific items. and the donor. Other items are recorded as being returned to 'Centre' for distribution. There are also details of the fund raising efforts, their organisation, expenses and profits. 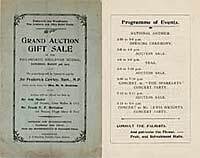 Even the gifts of '3 dishcloths' and 'a bundle of lettuce', for one event, together with the names of their donors, are not considered too insignificant to be noted. Interestingly, although the official remit for the first 18 months was to aid the 'sick and wounded in war', the notebooks show that most of their contributions were sent to 'Centre' for distribution, but there is also a short list of items sent to individual servicemen in those first 18 months. The first 5 links, below, are to the Reports and Treasurer's Accounts of the War Comforts Societies covering 1914 to 1920. The 6th link is to the handwritten notebook from the Failsworth Wesleyan Group. 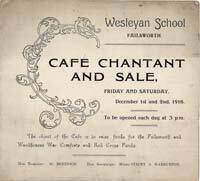 The next links are to fund raising activities and to other photos and ephemera associated with the 'War Comforts'. The final 3 links are to a personal report on the work of the 'Failsworth Wesleyan Church Comforts Section of the British Red Cross Society.' It was written by Elizabeth Jane (Mrs. Frank Arthur) Goodyear who served as president of the group from its inception. It records their association with the Central Red Cross Comforts Committee and their sharing in raising £6,000. It also records that the Failsworth Group also raised and distributed £500 on their own account. It goes on to list all the people who, "made the report possible .." The Back page records the Xmas gifts that were distributed etc. Finally, there is a paragraph that reads, "Mrs. Amos Rydings, then aged 72 years did 200 yards of knitting for operation stockings alone, besides much other work." Mrs. Amos Rydings was Elizabeth Jane's mother and she was obviously very proud of her mother's commitment. diary format 1914 - 1919. "on behalf of the Sick & Wounded 1916"
"on behalf of the Sick & Wounded 1919"
& Woodhouses War Comforts Soc.